Ubehebe Crater is a large volcanic crater 600 feet deep and half a mile across. We often hear mistakenly that "Ubehebe" means "big basket", but the Paiute name Ubehebe was first applied to the 5,678 ft. Ubehebe Peak, 24 miles southwest of the crater. How the name Ubehebe became associated with the crater is not known. To the Timbisha Shoshone Indians, the crater has been known as "Tem-pin-tta- Wo’sah", meaning Coyote’s Basket. Although applying this translation to the word Ubehebe has produced a great deal of confusion, but comparing the crater to a basket is appropriate. How did these craters originate? They are known as maar volcanoes, created by steam and gas explosions when hot magma rising up from the depths reached ground water. The intense heat flashed the water into steam which expanded until the pressure was released as a tremendous explosion.The western cluster of Maar volcanoes was the first to form, then the southern cluster, followed by Ubehebe—the largest of them all—possibly as recently as 300 years ago. Cinders from these explosions cover much of the surrounding area. This material is very evident as you drive up the hill to the parking area. Some cinders can even be seen on the dry bed of ancient Lake Rogers on the valley floor north of the craters. The cinders covering most of the area came from Ubehebe and are as much as 150 feet thick at the crater rim, decreasing in depth radially outward from there. The colorful layers in the crater’s eastern wall are fanglomerates through which the explosion occurred. Fanglomerate is an alluvial fan deposit hardened into rock. Sandstone and conglomerate, loosely cemented together by calcite make up this conglomerate and most of the pieces of rock are either volcanic or metamorphic. Water erosion created the deep gullies that you see on the crater’s east side. The pink and brown mud flat at the bottom of the crater is the site of many short-lived lakes. 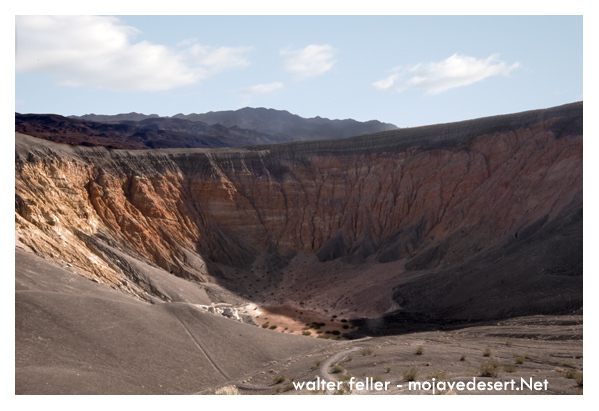 Ubehebe is not the only crater found in this part of Death Valley. There are clusters of craters to the south and west of Ubehebe. 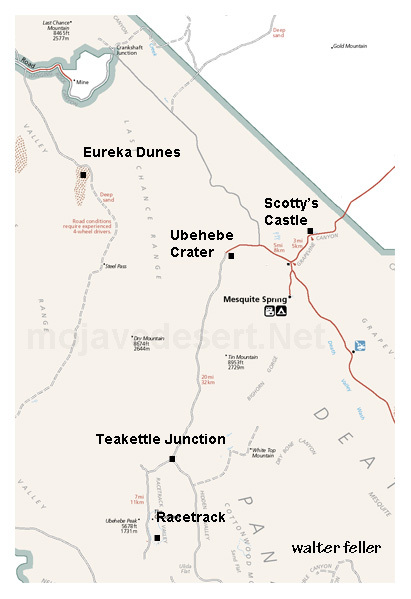 You can walk from the sign at Ubehebe Crater, around the rim to the west and over to Little Hebe Crater, observing various smaller craters along the way. Though smaller, Little Hebe appears to be even younger than Ubehebe as one looks at its almost uneroded rim. You can return to the parking lot the way you came or make it a loop hike by following the rim of Ubehebe on around to your starting point. Ubehebe Crater is easily viewed from the parking area on its rim, but further exploration will reveal smaller craters and interesting erosion. Difficulty: Walking to the bottom of the main crater is easy; however, the trip back up can be exhausting. Walking around the rim is moderately difficult due to the initial climb and loose footing. 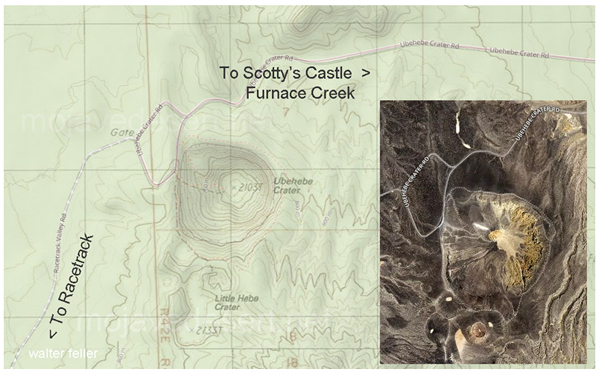 Distance: The walk around the rim of Ubehebe Crater is about 1½ mile round-trip. This route leads past several smaller craters, including Little Hebe. Safety: Please stay on the trail since the crater rim and nearby gullies are composed of very loose material making them unstable and dangerous. Ubehebe (pronounced you-bee-HEE-bee) Craters, located about 225 km (140 mi) northwest of Las Vegas, NV, and 88 km (55 mi) southeast of Bishop, CA, in Death Valley National Park, consists of thirteen overlapping volcanic craters. The largest crater is about 800 m (0.5 mi) wide and 250 m (800 ft) deep. The craters formed during a series of explosions set off as molten rock (basaltic magma) rising toward the Earth's surface flashed groundwater to steam (phreatic eruption). The explosive magma-water interaction blasted pulverized rock high into the air so that the ejected deposits are comprised of both basaltic lava (about a third) and fragments of sandstone and gravel from the preexisting landscape (about two thirds). Debris from the explosions blankets an area of about 40 km2 (15 mi2). Research by CalVO scientists suggests the set of crater-forming blasts may have taken place in response to a single batch of rising magma. The eruptive episode probably lasted a few days or weeks and took place about 2100 years ago. The geology of Ubehebe Crater, Cottonwood Mountains, Death Valley regional field guide.